In the summer of 1453 when St. John Capistrano visited Cracow, the capital of Poland, at the invitation of the Polish King Casimir, his sermons produced veritable miracles of conversion. 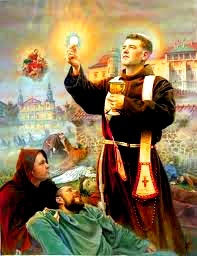 Many of the young people, too, among them many students from the University of Cracow, resolved to renounce the world and begged the holy preacher for the habit of the Franciscan Order. One of these was Szymon of the little town of Lipnica not far from Cracow. He had just taken his bachelor's degree in the humanities, and what is of greater consequence, by means of childlike veneration of the Blessed Virgin he had preserved his purity of heart unsullied. Although he had lived an innocent life, he now lived a life of great penance in the order, observed long fasts, scourged his body, and always wore a penitential girdle. On the feasts of our Blessed Lady he added a second one, in order to win her special favor. After he had been ordained a priest and been entrusted with the office of preacher in the convent church of Cracow, his words bore the impress of such zeal and eloquence that he brought back countless sinners from the paths of iniquity; and he then guided them on the path of Christian conduct with loving gentleness. Many of his auditors were moved to aspire to higher perfection. Szymon entertained an ardent desire to shed his blood for the Faith, and he hoped to be sent to Palestine to labor among the Saracens. This hope, however, was not fulfilled. He did have to suffer many hardships, but after devoutly visiting the holy places, he returned safely to Cracow. There another type of martyrdom was destined to procure for him the eternal crown. In the beginning he resumed his task of preaching with renewed zeal. Saint Szymon of Lipnica was obliged also to accept various positions in the order, including that of provincial. He was ever active for the welfare of his brethren and of all men, and allowed himself only the most necessary repose. He used to say that he hoped to enjoy a real rest when God would grant him eternal rest. His motto was: "Pray, work, and hope." About the year 1482, an epidemic broke out in Cracow and raged with terrible fury. Filled with love for his neighbor and the spirit of holy zeal for the salvation of souls, Father Szymon devoted himself entirely to the service of the sick. It was not long before he, too, was attacked by the dread disease. Filled with gratitude to God for this privilege and with Christian hope in a merciful judgment, Saint Szymon of Lipnica died a martyr of charity on July 18, 1482. Numerous miracles occurred at his grave, whereupon the Holy See approved his veneration. Beatified February 24, 1685 by Blessed Pope Innocent XI, he was canonized by Pope Benedict XVI on June 3, 2007.